Don’t wallow in monotony. Create your own fun! The next thing I knew, I had a master’s degree and was moved into a full-time teaching position(that’s what I get for swearing I’d never be a teacher with five to six classes a day) at that business college (it wasn’t a university, but it helped pay bills). After about three years, the Groundhog Day effect wore off. I couldn’t grow in that job anymore. Believe me, I tried. What is the Groundhog Day Effect? In the movie, Phil finds himself reliving the same day (February 2) over and over again. The same things happen to him everyday–the same routine, the same conversations, the same meals…the same monotony. He can’t escape this repeating insanity, so he tries to change it. However, he chooses antagonistic behaviors. He insults his co-workers, punches an old acquaintance just for greeting him on the street, lies to people, and eats donuts until he makes himself sick. When these behaviors don’t change his day, he escalates by trying to commit suicide. He gives up. It’s a good thing that didn’t work, because the movie would have had a sad ending. Now at rock bottom, he tries a different direction. Sure, he starts this new path just as selfish as before, but something starts to change. He relaxes, learns new skills, reads poetry, makes friends with the townspeople, finds ways to be kind to his coworkers. He discovers growth. When the daily grind starts to look and feel like it did for Phil in the first part of the movie, then it’s time to change things up. If we sit in the same position for a long time, we get sore. We have to get up and stretch. We have to move around. Eat chocolate. Monotony set in, despite my best efforts. I had to leave or risk punching a student for misusing compound objective pronouns or getting subject-verb agreement wrong in every sentence in her essays. I couldn’t tweak my lesson plans anymore or edit the near-perfect grammar tests or grade another essay that could be written better by a twelve-year-old or be told that a failing student had to pass–again. I’d reached my limit. There was no room for promotion, salaries were frozen (yet the director enjoyed plastic surgery and many overseas vacations), vacation time was impossible to take (no summers off either), and rumors of unethical practices were rampant. I’d taken on as much responsibility as I could, sponsored a student organization, and added Microsoft Office classes (MS Word was version 2 back then!) to my already long list of courses. During terms when I had all writing classes (no grammar or tech classes), there was so much grading that I might have thought about giving up, but I wasn’t Phil. It was time to stretch. I started a new career as a technical writer, where 17 years later I’m still finding things to learn. But what if we find ourselves in a monotony from which there seems to be no escape? We have to create our own fun–just like Phil did. Even if we have to work within the limits of our environment, we can set goals that allow us to grow and break the monotony. We have to harness the positive Groundhog Day Effect to keep ourselves fresh and happy, even when the environment is stifling. At some point though, we have to decide when it’s time to stretch somewhere else. 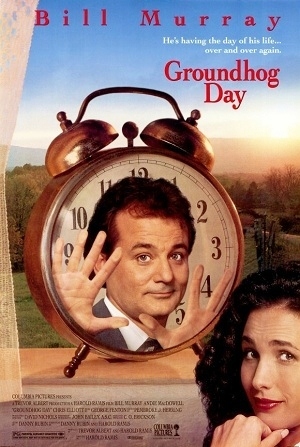 How do you harness the positive Groundhog Day Effect? What do you do when faced with daily monotony? How do you stretch to find growth?